I've written about the Google Chromecast before. Actually, I've written about it a couple of times. My impression of it has gone from "Well, isn't that cute" to "This is a decent device." If you already have an Internet streaming solution for your TV, it doesn't bring a lot to the table, but it brings some stuff. If you have a Mac (mid-2011 or later) and an Apple TV, it brings nothing. But, if you have a Windows computer (most do), this helps you send content from your browser to your TV screen. For instance, sister-in-law and nephew really like Breaking Bad. They also recently dropped satellite service. The only way to watch the new season of Breaking Bad would be to buy it from Amazon or watch it on the computer. That means huddling around the computer (which is what they did) or running a cable from the computer to the TV. Or, use a Google Chromecast device. This isn't new; I covered a lot of this before. I also mentioned that it could replace my Xbox 360 (which I only use for ESPN3 content) ... and it has; I've already boxed up the Xbox. So, what's new? Well, I did some research into how useful the Chromecast would be for watching TV. Say you don't have any streaming device: no Roku, no Apple TV, no Xbox 360 (with Live Gold account). Well, here's the answer: Maybe. 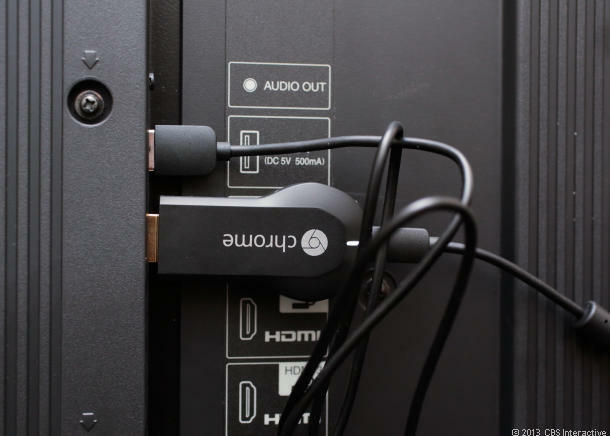 How did Chromecast fare? Better on broadcast than cable. The only top 10 broadcast show that you couldn't stream was #1 Under The Dome. If you authenticated with a cable/satellite provider, you could watch it, but for a cable/satellite replacement, the Google Chromecast won't handle that show. Yes, if you have an Amazon Prime subscription, you can watch it on your computer, but you can't stream Amazon content to the Google Chromecast unless you have Silverlight disabled. You see, Amazon uses Silverlight by default, but if that's disabled, will fallback to Flash, which can be streamed via Chromecast. Most other stuff will stream to Chromecast. For the cable shows, all of the TNT content require authentication with a provider. One of the History Channel shows -- American Pickers -- did, but one -- Pawn Stars -- didn't. The WWE wrestling show on USA is only available via Hulu Plus. Yes, you can stream Hulu Plus (as well as the free Hulu stuff) to Chromecast. So, this content a mixed bag. You don't need cable, but you need a different subscription service. Kinda like Under The Dome required. The ESPN show is a live sports event, and I don't know if it was available live. Probably not, unless authenticated. Anything that airs on ESPN, ESPN2, or ESPNU will require authentication. ESPN3-only content works fine, as long as you remember to open the content in a tab and not a pop-up window. Live sports is one of the drawbacks to the Internet streaming TV setup; you don't get much live sports. The rest of the top 10 cable shows all played from legal, free online content Websites. So, mixed bag using Google Chromecast as a cable/satellite replacement. As a supplement, it's great. Or, for me, as a supplement to Roku & Apple TV, it works fine. Why do I focus so much on this kinda stuff? I like it. A lot. And, it's saving me some money. If you're looking at ways to save some money by eliminating or lowering a bill, TV is a way to do that. Xbox, Apple TV, Roku, and Chromecast are some ways I've tried. They all work to varying degrees. Nothing is a full cable replacement. But, for the money I'm saving monthly, what I lose is worth the trade-off. "The only top 10 broadcast show that you couldn’t stream was #1 Under The Dome." That's good - but it will have to not stream a lot more top 10 broadcast shows before I'll buy it. Its nice to know that since I dropped TV from my life I apparently haven't missed a thing! What a line up. Yuk! That is the best it has to offer? You would have to pay me an awful lot to watch any of that drek! Creepy thought though: Is that what America has become? People who would actually spend time on that? Well, now, nobody said those were the best, just what America is watching. Kinda like Obama. He's the worst, but got elected. Twice. By stupid people. I am TV-less. A lightning strike took out the tv and the home computer on the same night. Wasn't watching anything but cooking shows and football anyway. Looks like a cool way to get to see a lot of useless crap though. Would I need one of those newfangled flat TV's? I was going to say that if saving money is your object, not watching TV at all can save you quite a bit. I seem to be on the majority side in this comment section.